I did some colorized shots while the tomatoes were draining. 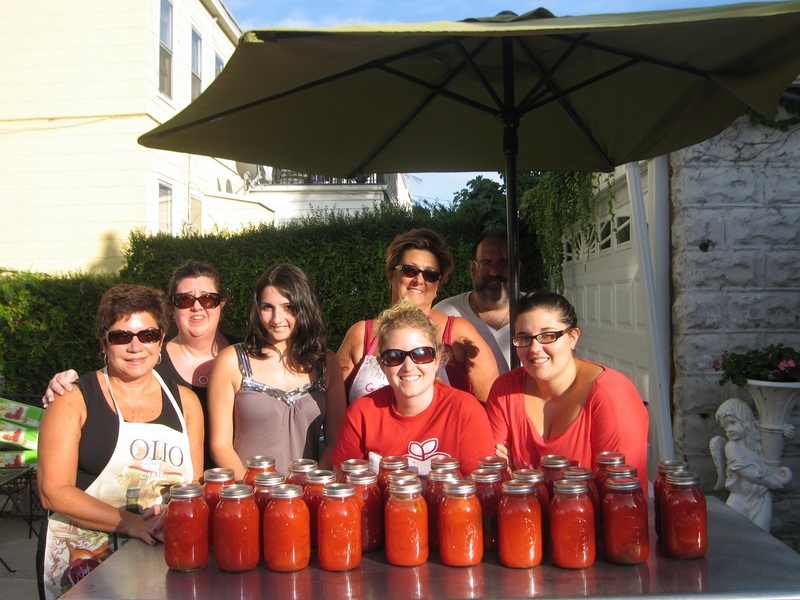 For the second year in a row my family has honored the new tradition of canning tomatoes. This year my Uncle swore to a new method of cooking the tomatoes longer so they would puree better. Here are some of my favorite pictures from the day including my brother stealing figs from the neighbor’s tree. These are step-by-step directions that my uncle printed out for all of us. Last weekend I fulfilled a long time goal of mine to learn how to can tomatoes. Mastering this process is listed as number 7 in the ‘Guide to being Italian’ handbook, right after having a child with the middle name Marie. 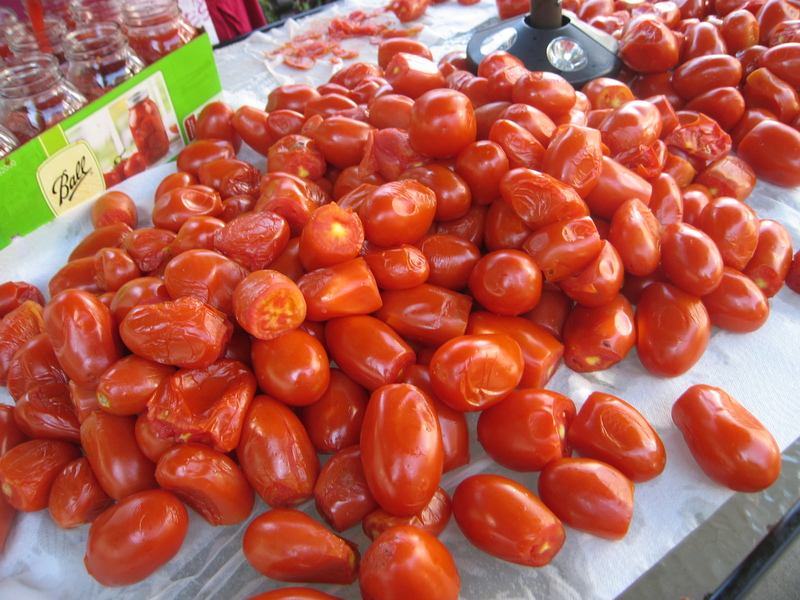 Seriously, the Italians were on to something when they thought to preserve this staple ingredient for the winter months when tomatoes are not in season. And although we rely on grocery stores to get us everything we need every time of year, often times produce is imported from far off places like Mexico or California that costs more to consumers and creates a greater carbon footprint. And canning is just more fun! Get the family together open a bottle of Chianti and play some Frank Sinatra. 1. 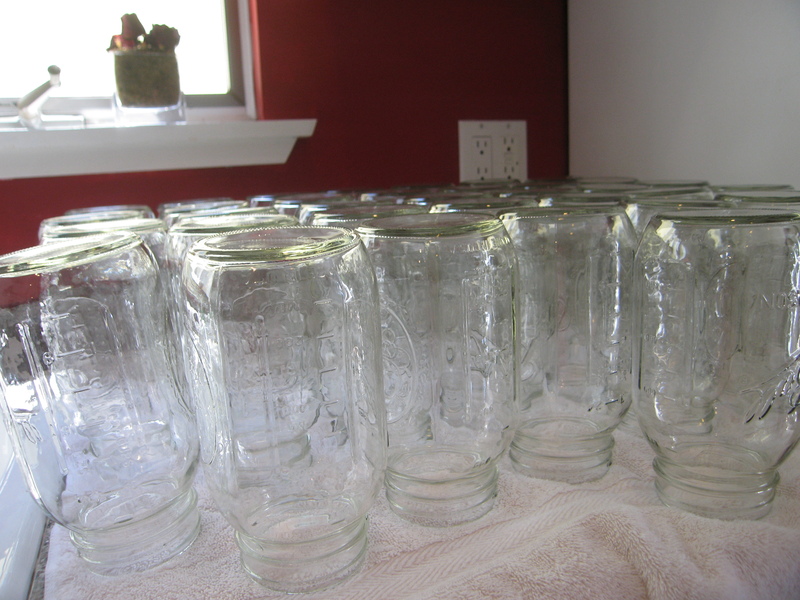 Wash and sanitize your Ball jars and lids. Most dishwashers can take care of this. 2. Rinse and remove the core from your tomato. Roma’s work well. Slit an X at the bottom of the tomato to help remove skin. 3. 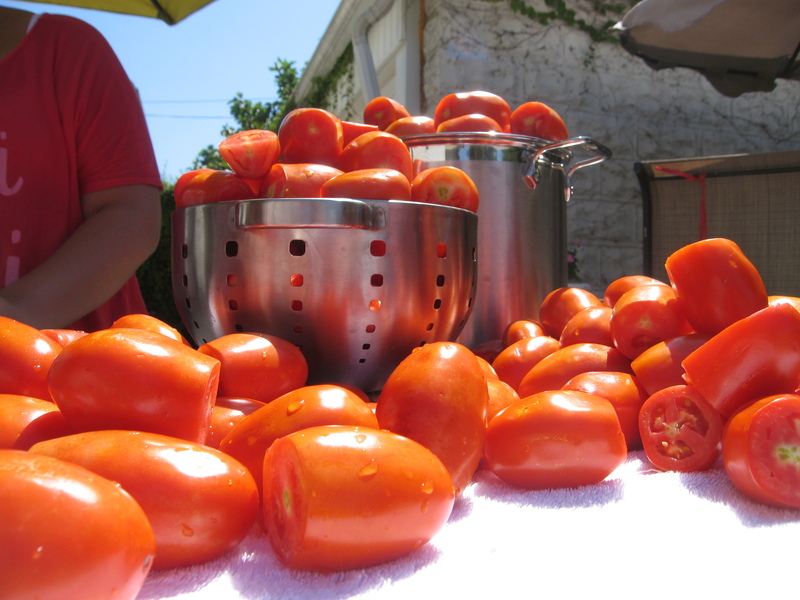 Bring a big pot of water to a rolling boil and drop in the tomatoes. Careful not to overcrowd the pot and drop the water temperature. 4. Blanch for 1-2 minutes and place in ice water to stop cooking. 5. Once cool, remove skins. 6. Add one tablespoon of lemon juice to pint jars (2tbsp for quarts) along with a basil leaf and 1/2 teaspoon of salt to jars (1tsp for quarts). 7. 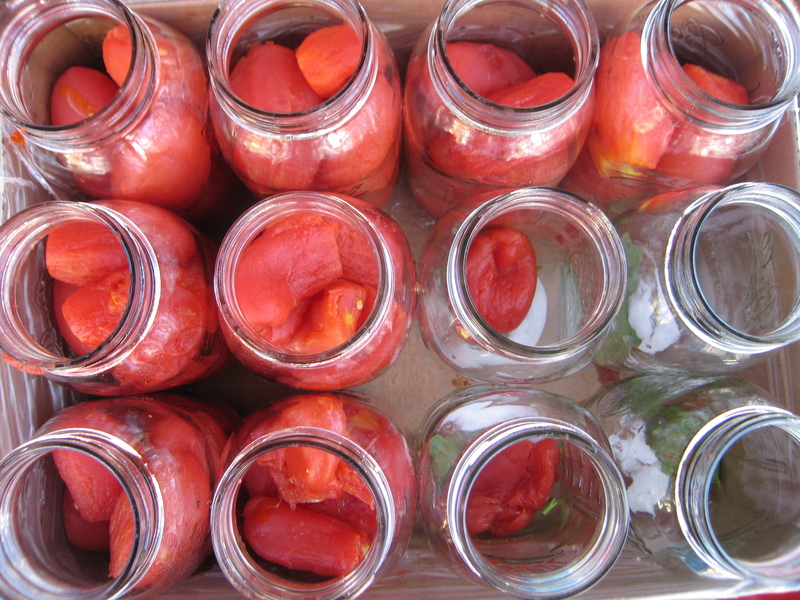 Squish tomatoes in jars letting the natural juices release and removing air pockets. 8. Wipe the rims and tightly screw caps on. 9. Bring large pot to a simmer and place jars in pot. 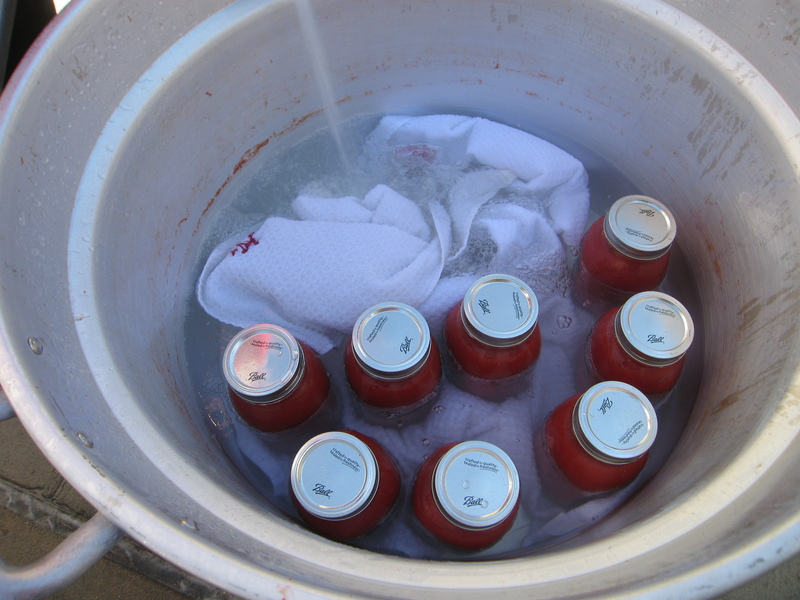 Use a rack or place a towel at the bottom of the pot. 10. Once all jars are in, cover and bring to a boil. Start processing time once water is boiling. Boil pints for 40 minutes and quarts for 45 minutes. 11. Once complete, gently remove from water and let cool 12-24 hours. Check lids and remove screw top. Store in a cool dark place. Canning peaches is very similar to tomatoes. 1. Wash and sanitize jars and lids. 2. Blanch peaches, once cool cut in slices and remove pit and any fibers along the edge which can turn dark during storage. 3. To prevent darkening, places slices in salt water until ready to can. 4. Create a simple syrup with 4 cups water and 2 cups sugar simmer until dissolved. You’ll use about 1 1/2 batches of the syrup for every 7 quart jars (17.5 lbs of peaches). 5. Put peaches in warm jars and cover with hot syrup. 6. Remove air bubbles and screw on caps. To spice it up, add 3 Tbs of crushed cinnamon stick and a bunch of whole cloves in a cheese cloth to boiling water.